When I was a young pup (in the era when we used to program computers with punched cards), the three most commonly used valuation ratios for stocks were the P/E ratio, the P/B ratio and dividend yield. Now all three of these metrics are pointing a long-term low return environment for equity prices. In a recent post, I showed that the trailing P/E ratio for the SP 500 was elevated relative to its own history, even adjusted for the current low level of interest rates (see A secular steer?). 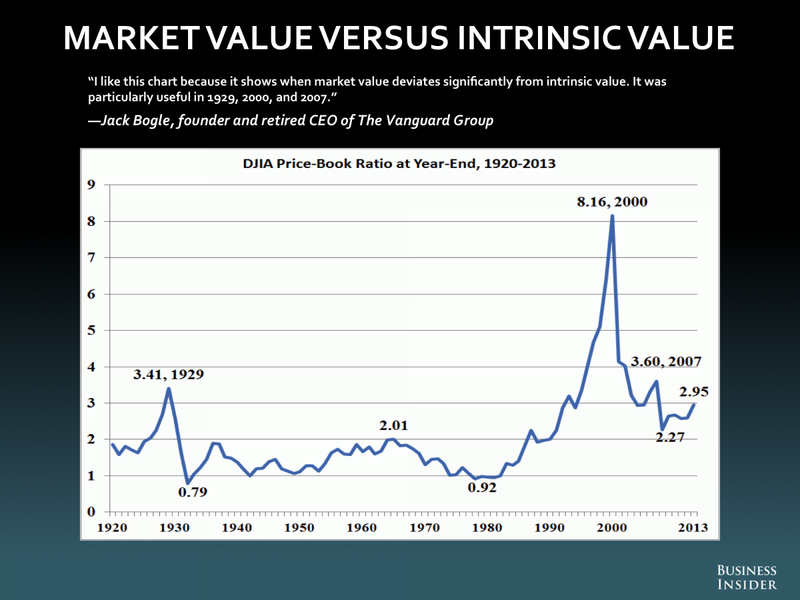 Jack Bogle of the Vanguard Group provided further evidence that equity valuations are high relative to their own history based on the P/B ratio. 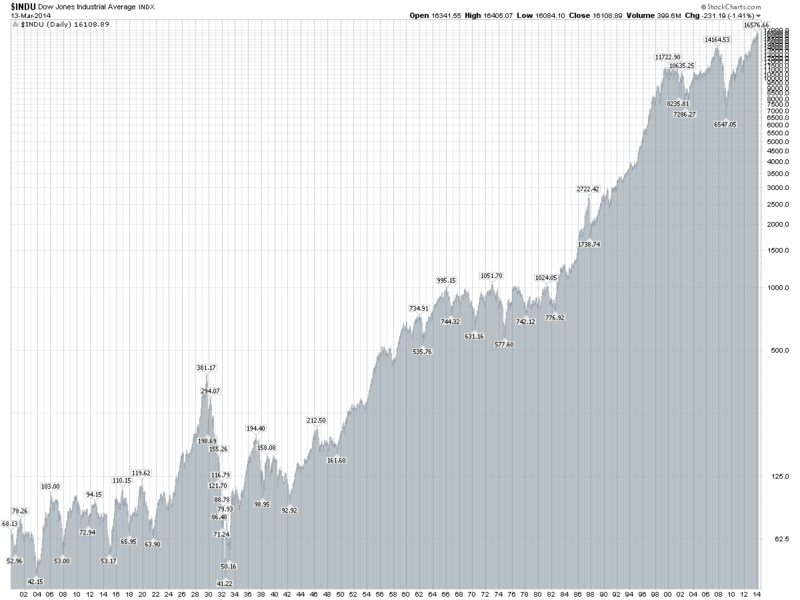 Like the chart above, the P/B chart goes back to the early 1900s. 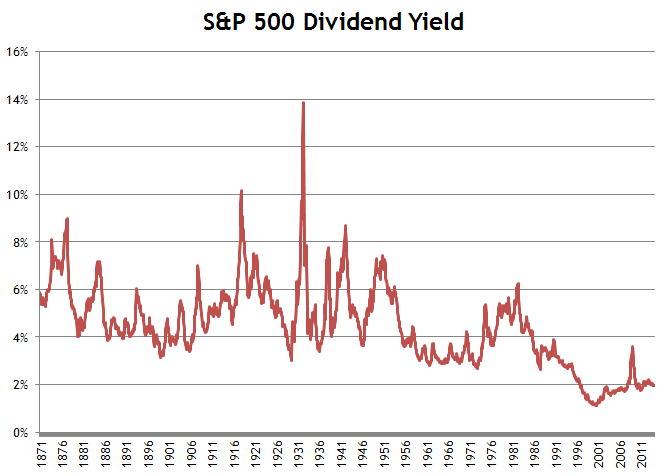 The SP 500′s current dividend yield is 1.94%, which echoes the interpretation of most other valuation metrics. Stocks are not necessarily expensive relative to their average value over the last 15 years, but are very expensive relative to long term history. In past posts, I’ve toyed with the idea that this might be justified–maybe we’re in a new paradigm for value. But if we are in a new era of structurally higher values, then we have to consider an important result that comes with that. If stocks are structurally more expensive than they were in the 20th century, can we expect to receive the same rates of return that we did in that era? If we are leaving the 20th century behind, then maybe we have to leave behind our concept of fair returns on investment. Dividends are one signal telling us to lower our expectations. I would tend to agree. Equity valuations appear to be elevated but they are not stupidly high. None of these metrics are pointing to a market crash around the corner. However, as the major US equity averages have broken out to new all-time highs, I have seen technicians calling for a new secular bull market, with the expectation that returns would be similar to the 1982-2000 era, or the 1947-1966 era. Historically, secular bulls start at compressed valuations, not elevated ones. If this is indeed a secular bull, then investors should expect long-term returns to be far more muted than the last two secular bull markets. This valuation analysis puts some context into my most recent call for a midterm election year correction (see Should you sell in May?). Let's do some simple math and assume that 10 year return expectations is 5.0% (an arbitrary assumption, but roughly in the right ballpark). Supposing that instead of correcting, stocks were to rise 25% in a single year, but 10 year returns stay at 5%. Simple math tells us that the return for the remaining 9 years comes to 3%, which would make equity prices highly stretched as they would be unattractive relative to 10-year Treasury yields. On the other hand, a 15% pullback in a year would raise 9 year expected returns to 7.5%, which is a level that is far more interesting for investors. You can play around with some of the assumptions, but the bottom line is that equities do not have room for the kinds of rallies that we saw in the 1980's and 1990's. The moral of this story: Lower your return expectations.